An Adoption baby shower is a rewarding end to the long road of awaiting a new child. Those parents have waited patiently for a gift that some people take for granted. In my book, adoptive parents have double rights to celebrating a child. The miracle of birth and joy of raising children awaits the happy couple. 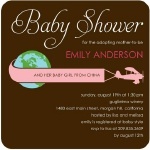 Help get them ready for their journey with an adoption baby shower. Although almost any theme can work for an adopted child, there are a few extra special touches that will make this celebration one to remember. Take any of the ideas below and mix with any theme of your choice to blend a special concoction of love for the new parents. A long and challenging journey has come to an end, Come celebrate the new one that is just to begin! 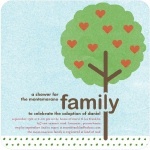 Join us for celebrating the new baby adopted into the (parent's names)family and our hearts. 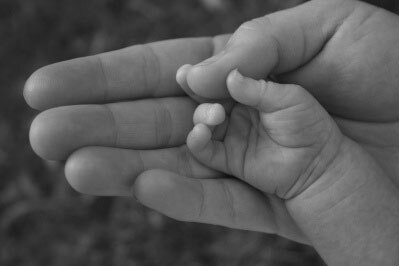 Since an adoption is an incredible journey in itself, create memory items to help the new parents cherish each stage of the baby's development. Scrap booking memories- Put together a scrapbook of the baby's firsts. Some items could be baby's first diaper, bath, tooth, fever, plane trip, halloween, christmas, birthday, movie, play date, etc. Lay out all necessary scrap booking items and have guests join in on the fun. Take turns decorating pages and writing encouraging advice to the parents. Advice basket drop- Arrange beforehand to have guests bring advice with them to the adoption party. The advice can be on parenting and marriage with raising children. Have the guests decorate and put advice on index cards for the new parents. Then give them envelopes to write their address information on and place in a basket. During the baby shower, you can draw names for prizes and read the advice. Then the envelopes can be used after the baby shower to send out the thank you cards. Use fun and unique games at your adoption party focused on the new baby. Adoption Baby Trivia- Create your own trivia on the baby's adoption information. Find out the specifics on where the baby is from, what the culture is like there, information on the baby's arrival(if they already have the baby), and interesting adoption tidbits. 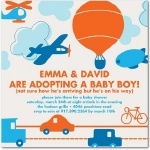 Adoption Madness Gift Game- Picking up an adopted baby is no different for the excited parents than a pregnancy birth. They still go through anticipated excitement and frazzled moments as the big day arrives! Play this gift game with your guests and have them scramble to keep up with all the crazy rights and lefts of the story! Download your free copy of Adoption Madness. You will need adobe in order to view and download this game. (a new window will open so you can download without leaving this page). Celebrity Adoption Trivia- What you may not know about certain celebrities can surprise you. Delve into some not so well known adoption facts of famous people with this trivia. Download your free printable copy of Celebrity Adoption Trivia. Decorate with gift boxes, gift bags, baskets and balloons. Post signs up that say "A baby is a gift" and "Heaven showered us with love". Decorate in baby colors. If you have an additional theme, mix the decorations together. Decorate the room to represent the area of the world the baby is coming from. If the baby is from Mexico then decorate for a Mexican fiesta, if the baby is from Paris then decorate with French flair! If the adopted baby is from another country or state then use the traditional foods from that area as the food theme. This will give the guests a chance to take in a taste the culture of the baby's homeland. Take Candy and attach cute sayings to it about raising a child. Give these out as prizes to games. Mounds- The wisdom you will learn when raising a child. Almond Joy- For the joys of parenthood you will experience. Take 5- Make sure to take time out for yourself. Snickers-The cute things they say will give you lots of snickers. Sweet tart- For all the sweet and sour times. Milky Way- Milk will be their favorite drink for the first few years. Hugs and Kisses- Make sure to give your child plenty of these. 100 Grand- It might feel like you spend this much on your child! Sugar Daddy- For when daddy feels like spoiling his kids! Thank you for attending our baby shower. We are excited to see our "sweet pea" grow! Thank you for nourishing the "seeds" of friendship in our hearts. You didn't grow under my heart - but in it. where they got their start. a love through joy and pain. This poem is sure to bring a smile to your face! It is written by a mother who adopted and shares her point of view on the matter. I cracked me up and I hope it will do the same for you. I could still zip up my pants!? Hopefully these ideas will help you with hosting your adoption baby shower for those lucky adoptive parents! Remember, an adoption baby shower can be used in combination with any theme and most games. There are tons of ideas on this website to help you plan the perfect party.